The knock knock joke- kids love telling them, adults hate playing them. 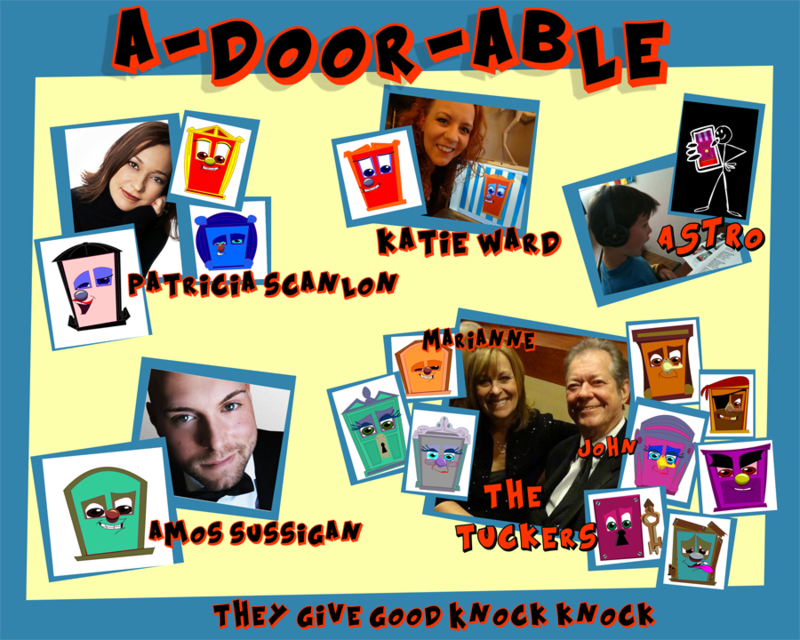 This app fixes all that, so check out knock knock and the who's there doors app and lets tell some jokes. Best Animated / Voice Interactive App EVER!!! Dude, kids loved it! Super cute watching them play the game. And then, for the rest of the night, they repeated the jokes to us. I think it's going to be a big hit. Scott Moore, writer of "THE HANGOVER"
This August, the knock knock joke comes to the small screen with Knock Knock And The Who's There Doors app for iPhone and iPad. 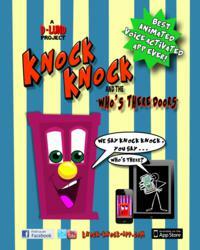 Knock Knock lets kids interact with a cast of characters through a series of voice activated knock knock jokes, complete with animated punch lines. Ideal for the "dog days of summer", children will love interacting with these new friends either all on their own or by sharing the fun in a group setting. Grown-ups are sure to enjoy the experience as well by watching their child "yap" into their "app" or by joining in the silliness themselves. Knock Knock comes from the mind and creative heart of Disney animator and ANNIE award winner Dan Lund. Lund’s credits include every tent pole animated feature since 1989 including "Beauty and the Beast", "Aladdin", "Lion King", “Winnie the Pooh” and "Princess and the Frog" as well as the upcoming Disney animated musical "Frozen". Lund’s inspiration for Knock Knock came from a Christmas visit with his niece and nephew who inundated him with the jokes for the entire trip. He couldn’t believe how much fun they had telling these silly jokes for hours on end. Realizing this must be a right of passage that every kid experiences, he then set out to celebrate this charming touch stone in the growing up process by creating the best developed app he could dream up. The little details are a big part of what makes this fun for the whole family app a stand out, from the high quality animation to the voice activation technology. Each volume of jokes is hosted by "Knock Knock" and along with his gang, "the Who's there Doors", the player is lead through a series of 60 interactive jokes fully animated and voiced by top artists from the world of family entertainment. "I treated this app idea the way any Disney film is treated” says Lund. “We are creating a world that folks want to be part of with characters that are taken to heart and enjoyed over and over again". The Knock Knock creative team includes app developer Arno Kroner and a who’s who of voice talent featuring among many, Lund’s a long time creative collaborator John Tucker. Tuckers work at Disney started in 1961 and included working with Walt himself. As if a 45 year carrier at "the mouse house" wasn't enough, he also contributed to the classics Scooby Doo, the Smurfs and the Flinstones. One of the most impressive achievements in the project’s development process is that Knock Knock is 100% kid tested and approved, no joking. Lund helped school aged family and friends become certified as official Apple beta testers whose feedback on fine details, from sound levels to the elimination of adds on the app entirely, were applied to the final product. And they aren’t stopping there, the Knock Knock website will also include a section for joke submissions where kids can send in their own creative knock knocks so that children will always be a part of the brand’s creative development process. To connect with fans more directly there will also be an interactive knock knock facebook page that will encourage kids to upload video of themselves telling original jokes that might just get animated and posted back on the site! In a time when everyone is plugging and checking out, Dan Lund hopes this app encourages a new trend of sharing and connectivity and as we all know, things are always better when there is a good Knock Knock joke involved! Knock Knock Volume 1 and Volume 2 are available now in the Itunes app store for iPhone and iPad priced at .99 each. Coming soon, look out for special Knock Knock Christmas, Halloween and pirate themed volumes! Dan Lund, as well as the producer, voice talent and all involved, are available for interviews and can offer original graphics, animation and video to keep reviews fun and unique. Promo codes are available for reviews.